Update: SQB now supports 'quirck' particles! See latest post! I've been awfully busy with many private and work related things, so had to shelve many projects and stick to a few that I use frequently myself for private or work purposes. I *was* working on something called Music Commander, and some parts of that will show up in SQB at a later stage. For now, SQB is just a tool that manipulates .m3u playlists. Last edited by blueznl on Mon Apr 01, 2019 11:58 am, edited 7 times in total. Looks to be a Total Commander style music player. PureBasic Rocks! Even More! And More! PureBasic 5, Now We're Really Rockin! Cool! I had Directory Opus and Filemaster on Amiga back in the days. This really seems like 90's Filemaster/commander program? Other plans for functions? Custom UI? File organizing is hard business! But I just might add some file management features, the basic kind of stuff. 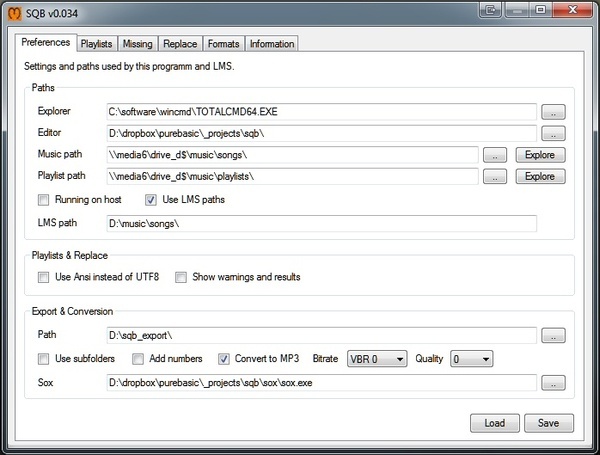 Music Commander is primarily a little tool to copy (and downconvert) music from your server / music collection (in MP3 or FLAC format) and send it to your MP3 player (be it a phone, an USB stick for your car radio, etc.). It will downconvert on the fly, so those devices that cannot handle FLAC will see MP3's, and you can squeeze the quality to something that allows more music in less space, and at a quality that suits your taste / equipment / environment. Work is slow though. I'm still finishing the refurbishing my house, which took way more time than expected. A question to all: I've been playing around with Sox, but it would be nice to have access to a library instead of using an external tool for some things. (Sox works, but etc. etc. etc.) Any suggestions? This little tool makes some sense for people with a SqueezeBox server. To others... perhaps not that much. Very early version, mostly for my own use. No documentation whatsoever. Note: source included, Sox included, DLL's included. If you are outside the EU you might not be allowed to use these DLL's to convert to MP3's. I have a generic tool here that does this. Without S.M.A.R.T. monitoring or RAID 1 or 6 it's the next best thing. There are also restore volume on reboot solutions to mitigate software corruption. I am very, very confused about your reply. It seems to have nothing to do with my program... Could you please elaborate? I made a cross-platform software level folder and drive change logger. It uses CRC32. It doesn't edit playlists though. I was referring to data loss really not playlist editing. 1. IF you have lots of music AND use .M3U files AND have renamed one or more files or folders, THEN SQB helps retrieving / editing the .M3U files. 2. IF you have M3U playlists AND you want to copy / convert the playlist to a local folder ready to place it on an SD card / USB stick THEN SQB uses Sox to help you convert them. If your car / mp3 player doesn't support playlists, or doesn't support .flac files, then this is for you. A new version of SQB and this time we are proud to announce the new and awesome mix function based upon 'quirck' particles!
" With the latest release of SQB we herald the return of the legendary 'mix tape' or, in this case, 'mix list'. Thanks to a combination of our '16 band 17 insert point' dispersion shuffle algorithm, and the use of 'quirck' particles SQB can now blend two playlists and create an attractive new mixed list with a combination of overall evenly spread yet somewhat irregular distribution of song titles. Perfect for intellectually challend species such as you! No longer do you and your lover have to suffer strictly mathematically correct but oh so boring interleaved lists, alternating between your superior taste and his / her, eh, gender defined preferences. Nor will a strict harsh randomness hurt your senses any longer. We took care of it with our new 'mix' button in the playlist section. Note: using quirck particles is, of course, completely at your own risk. Our scientists and engineers are reasonably sure that any damage the use of quircks would cause, such as causality interference and sporadic rifts in the time and space continuum, are probably largely repairable. In time. Once we know how. If your car / mp3 player doesn't support playlists, or doesn't support .flac files, or you are in desperate need to fix your painful collection of playlists, then this is for you.